This probiotic dressing is full of the fungus Aspergillus oryzae. Eat it over salad, or as dip for your favorite veggies. Miso, a fermented soy product, has a complex umami flavor. Paired with the nutty, rich tahini, this dressing will make any veggies feel like a meal. 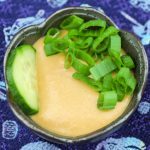 In a bowl mix whisk together the miso, tahini, rice vinegar, and orange juice slowly add the water until you reach a thick but even consistency. I usually add 1/4 cup of water for a dressing, or 2 tablespoons of water for a veggie dip. Mix in the green onions, and serve. For this recipe, I recommend this strong flavored miso paste, and this deeply nutty tahini is perfect in any Asian cooking. *Please be careful if you can't eat gluten, some pastes contain wheat or barley.